So it’s been a while since I last updated. Honestly, I’ve just been busy and doing things and traveling, etc. I apologize for the hiatus and hope this post is just as entertaining as the others. First, I’ve been traveling a LOT. I’ve always wanted to travel around Europe and being in Bilbao has finally given me that opportunity. 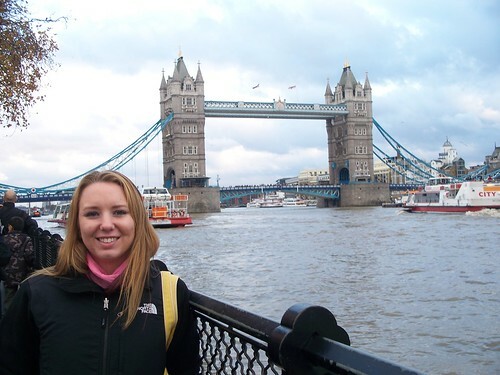 Europe is absolutely amazing… I have fallen in love with every city I’ve been to. 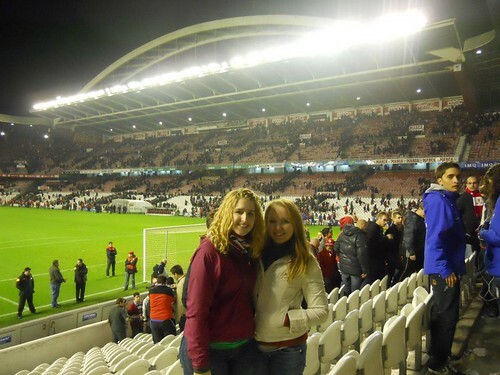 Let’s start from the beginning though..
My friend Haley and I went to a Bilbao Athletic soccer (or football) game. It was a lot of fun, but very different than what I was expecting. It was nothing like a baseball game in the US at all. I don’t really know what I was expecting, but I was very surprised by the whole atmosphere. We stood the whole time which was fine, and I guess the fact that I don’t know how soccer works really might have been a slight issue. The funny thing was though, we only saw one goal and it was the other team’s goal scored by a player on Athletic. Sigh.. such bad luck. Here’s a picture of me and Haley at the game! I should be able to update after I get back from Italy and before I leave this beautiful city. Until next time…..
It’s been too long since I’ve updated everyone on my incredibly interesting life. It has been a very busy couple of weeks with not many interesting things happening though, until this past weekend. 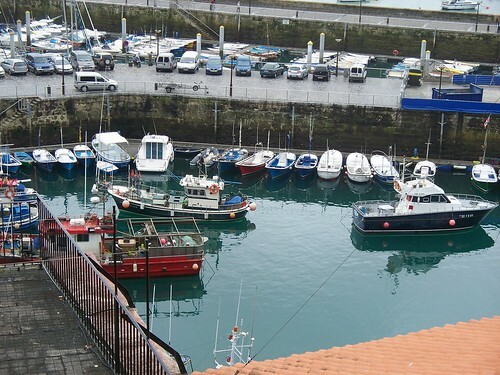 Last weekend, we actually stayed in Bilbao woo!! I still love the city and love how every place I go feels new and exciting. I had real assignments due in my classes last week which was terrifying. I don’t really know how grading works here and I was scared that I did everything wrong… basically freaking out about everything. As it turns out though, I like the grading system 🙂 I got an A on my first test here as well as an A on my first paper. Go me! My classes are still all interesting and I’m still enjoying them a lot. Two weekends ago (not this past weekend, but the one before) we went to a couple new clubs. It’s weird, at home I’m more inclined to go to Happy Hour and bars in Clarendon… but here we pretty much always go to clubs. It’s probably more expensive, but one thing I have learned is that while you have to pay a cover charge of around 15 euros, you always get at least one drink included and sometimes two. At least it’s not JUST a cover charge.. But anyway… we went to a club called DaVinci on Thursday night. It was free to get in so that was nice. That night was the like “induction” of the freshmen at the dorms. So all the different floors were dressed up as different things like the rugrats, babies, Wilma from The Flinestones.. it was weird but cool. So the place was packed and it was pretty fun. Most of the people from CIDE were there so that was nice. On Friday we went to this big club called Fever. Fever is AMAZING. It’s in the creepiest location ever, but that doesn’t deter from its awesomeness. It’s in a huge warehouse with 3 different rooms that have different music. It got packed around 2am and my friends and I were all out til about 6am. I did not have a voice the next day. It was amazing though. I still can’t believe people here actually don’t go out until 2am. It’s hard to get used to, but obviously I’m managing. This past weekend was much more interesting. 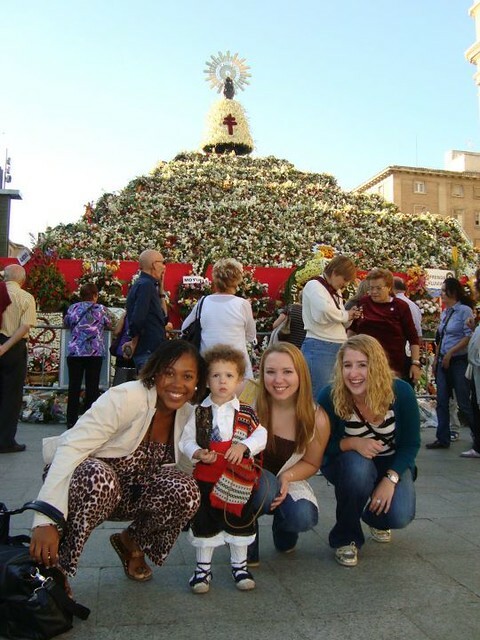 My two friends, Haley and Stacy, and I went to Barcelona!! A bunch of other kids in the program were going too but the three of us took a train together and stayed in the same hostel. 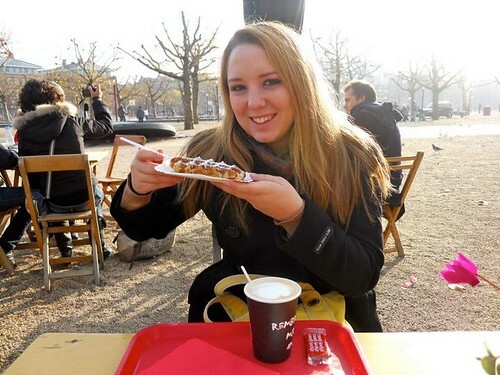 This was my first experience ever staying in a hostel and it was a GREAT one. It wasn’t that close to the city center but it also wasn’t too far. The atmosphere was fun and it was just a good time. We met some other travelers and made some friends so that was cool. 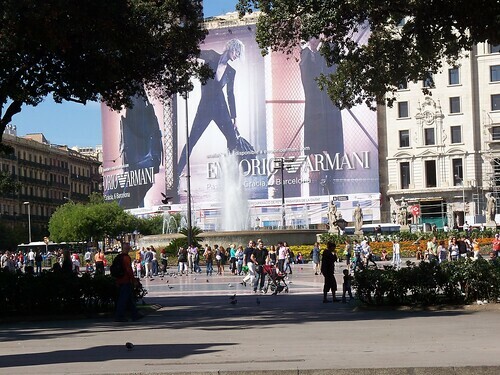 Barcelona is ABSOLUTELY AMAZING! I might love it more than Madrid, I’m not sure though. We didn’t do every tourist thing possible because we just didn’t have the time, but we did the major things. 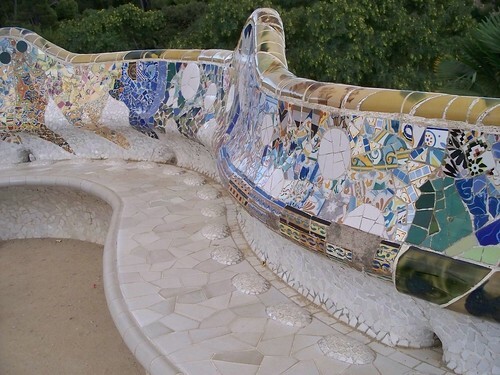 Parc Guell was absolutely breath taking. EVERYTHING was made out of those tiles. It was so gorgeous. It was probably my favorite place that we went. Also, fun fact, one of the season finales of America’s Next Top Model was shot there. Cool, right? 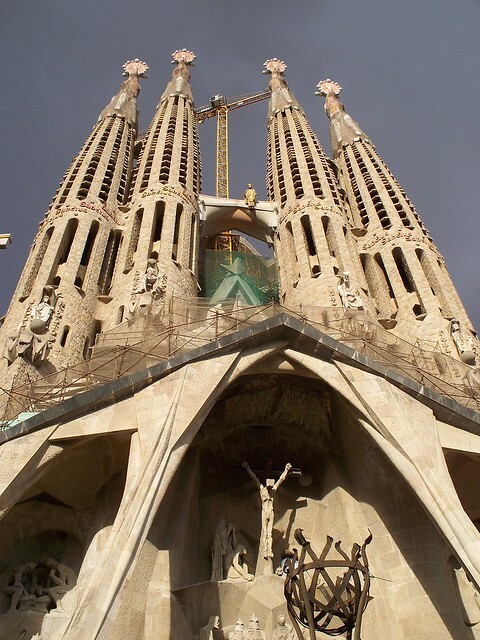 La Sagrada Familia is a huge church that Gaudi was building. He was very inspired by nature and religion. One side of the church, on the outside, is the nativity scene and the other side is the story of the Passion of Christ. It was incredible. 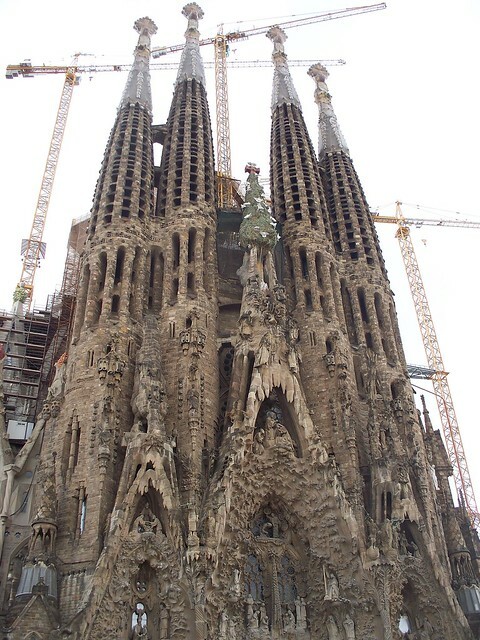 Unfortunately, Gaudi died (he was hit by a tram) before ever completing this church. He died in the 1930s and the church is still not done yet. The building of this amazing church is being funded by anonymous donations and ticket sales. That’s the reason for all the construction around it. I really hope it gets finished in the near future because it is definitely a major part of the city. 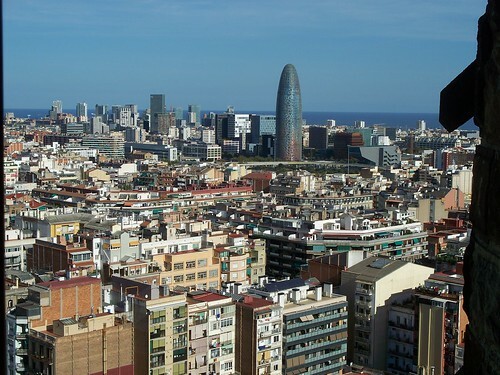 We went to two different clubs in Barcelona. They were cool but nothing that special. I’m really getting sick of house music. Oh well. It was fun though. 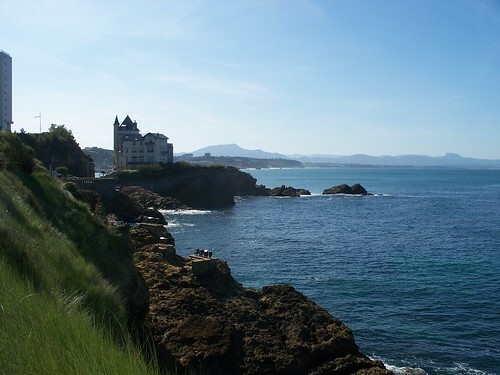 We are staying here this weekend ad the weekend after we have a day trip to the South of France. We have a 5 day break over Halloween weekend and Stacy, Haley, and I are going to London!! I’m super duper excited for that!! Also, tomorrow is El Dia de la Hispanidad. Basically, it’s Columbus day so we don’t have school! Woo! I do love all the random, awesome holidays they have here. We barely get any holidays in the states! 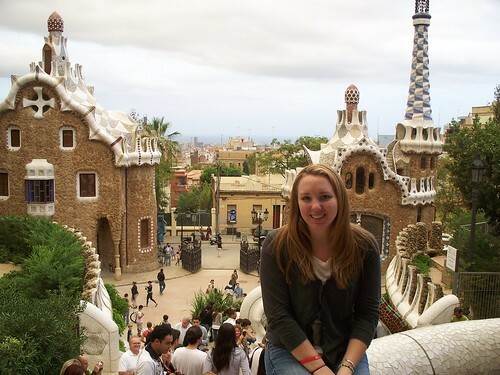 This past weekend the CIDE program took us to Madrid and Toledo. And honestly, IT WAS AMAZING!! Madrid is the perfect city. Don’t get me wrong, I still love DC, but Madrid just has so much more history and crazy shopping places, like an H&M that used to be an old theater. The streets are beautiful and there are so many people around all the time. The markets are adorable and the plazas are gorgeous. You can definitely tell that I’m a girl who would rather be in a big city just by the way I was so happy and amazed at everything in Madrid. 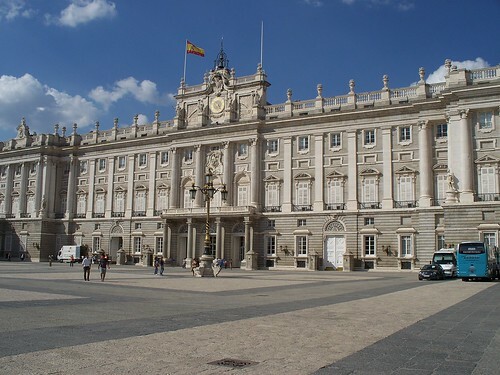 We also went to the Royal Palace which was INCREDIBLE. I can’t believe kings of Spain actually lived there back i nthe day. Now it’s just a museum and the royal family lives elsewhere in Spain. Speaking of the royal family… the Queen of Spain was at my university today.. no big deal..!!! 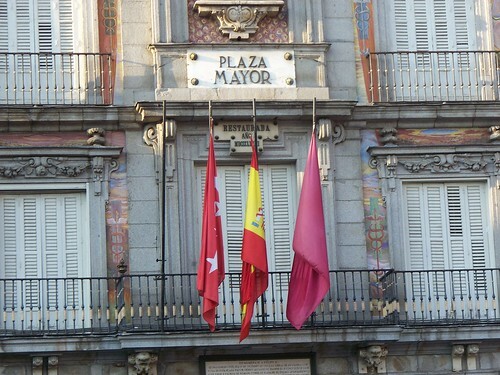 Plaza Mayor where I saw my first flag of Spain flying. 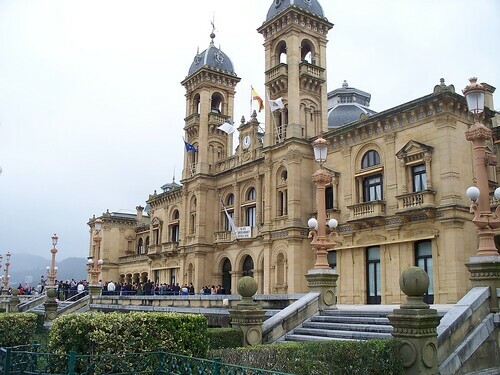 In the Basque country, they want to be autonomous from Spain so even their government buildings only have the Basque flag and not the Spanish fllag. Crazy. There was a guy making HUGE bubbles and I thought it was pretty. 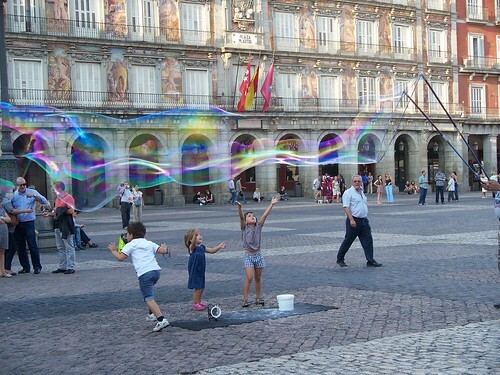 This is also in Plaza Mayor. 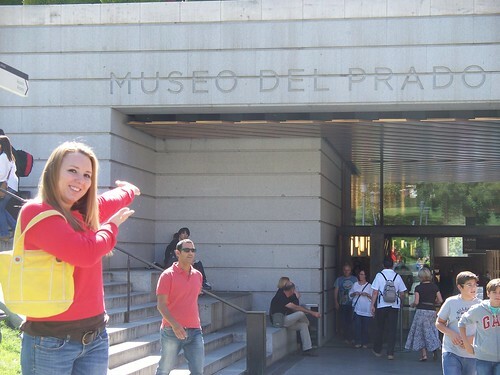 Me in front of the Prado Museum. 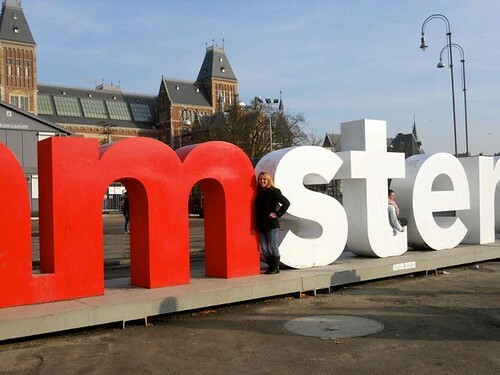 The third most famous art museum in the world. We got to see some amazing collections, like Goya, Vasco, and Vasquez. That said, Toledo was also amazing. Toledo is about an hour outside of Madrid and it was the capital of Spain before Madrid was. Toledo has SO MUCH HISTORY! There is literally a wall built around the center of the city to keep out enemies. 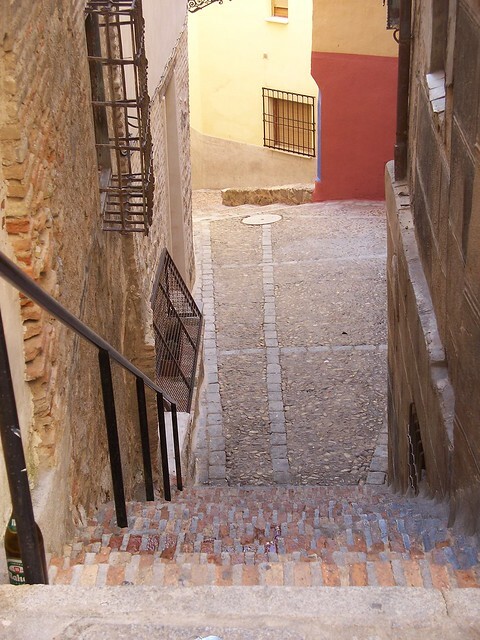 When you think of a medieval town, Toledo is probably what you think of. While we were in Toledo we went to the Catedral de Santa Maria de Toledo (Cathedral of Saint Mary of Toledo). 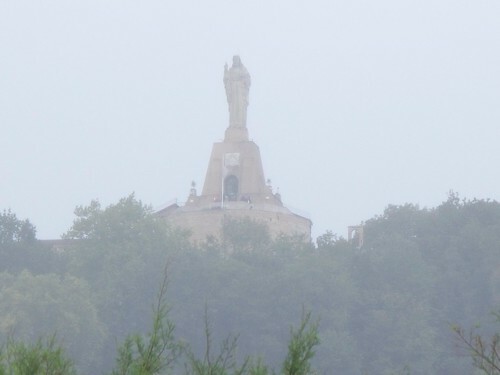 They wordship the Virgin Mary there for lots of reasons, but mostly because it is said that in Toledo one of the Saints defended her honor by saying she really was a virgin when she had Jesus and so the Virgin Mary thanked him. Or something like that. 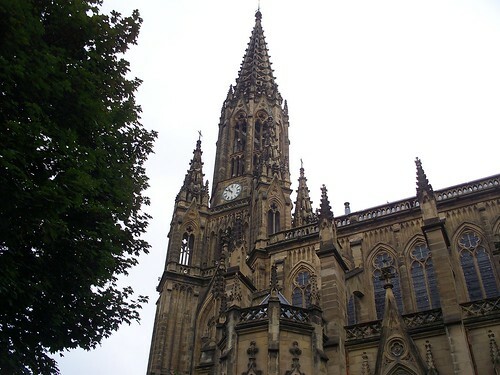 The cathedral is an old, gothic style church. 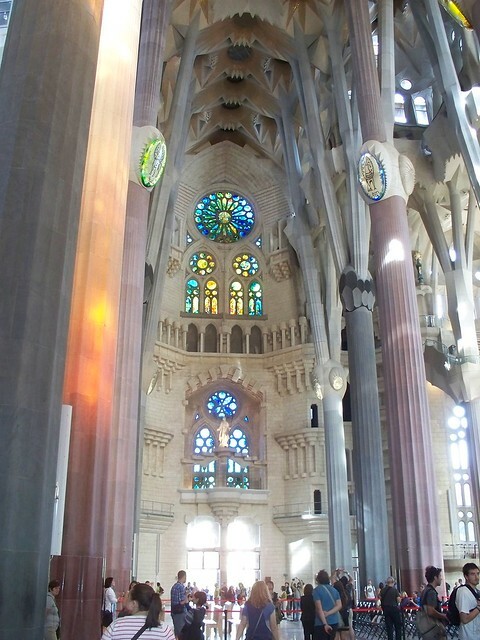 There were tons of stained glass windows. 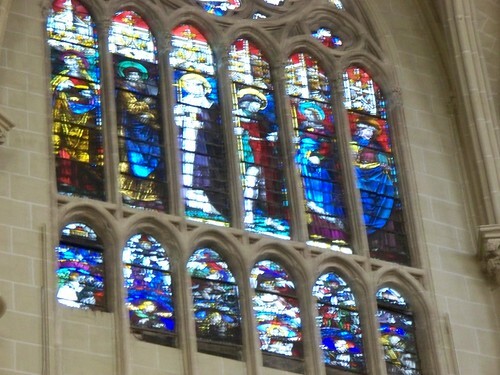 Since not everyone in the town could read, the bible was shown through pictures in the stained glass windows. Pretty sweet. There is also a HUGE castle made out of gold, silver, platinum, rubies, emeralds, EVERYTHING EVER that inside the church. It was so shiny and pretty. 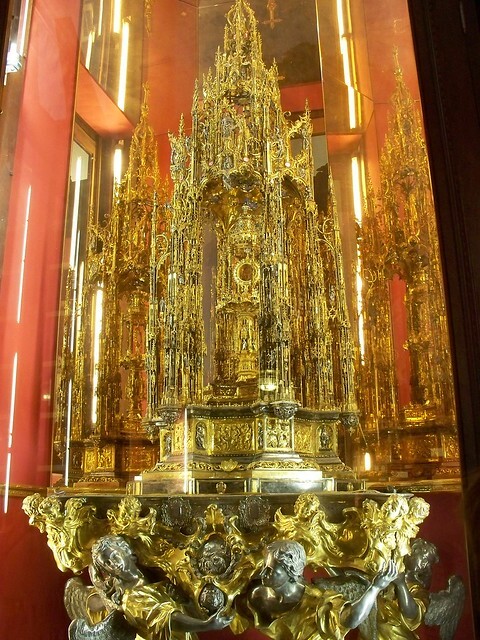 I think the coolest part about it though, was that there is a part in the center that has Jesus inside of it, and it is rumored (and probably true) that that part is made out of the first gold brought back from the Americas after Columbus went over there. Cool right? Toledo was beautiful and so full of history that I really hope some day I can go back and experience it in full. This is definitely my favorite picture that I’ve taken in Spain thus far. I got a panoramic shot of the entire city of Toledo. Breathtaking right? 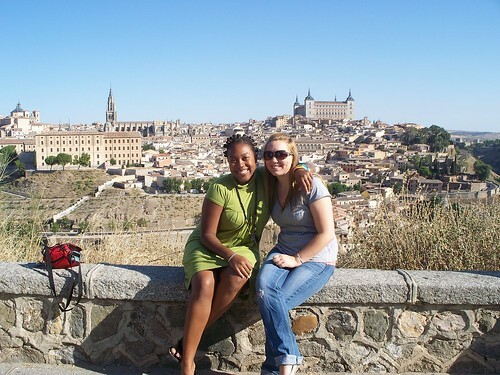 Me and my BFF from Jamaica, Rachel, sitting with the city of Toledo behind us. Stained glass windows telling the story of the Bible through pictures in the Catedral de Santa Maria de Toledo. The gold castle in the Cathedral made with the first gold from the Americas to reach Spain. These two people were RIDICULOUSLY strong. It was really cool. School has definitely started to pick up. I have a paper due and a test next week. Womp. I did meet my Tandem partner yesterday. Tandem is a program that CIDE offers where you sign up for it and they assign you a Spanish speaking partner who is trying to learn English. We’re supposed to meet regularly and half the time we talk in Spanish and the other half in English. My partner’s name is Paula and she’s SO nice. She speaks pretty good English which makes me feel kinda bad since my Spanish isn’t that great. She really helps me though and doesn’t get frustrated or anything. I’m really hoping that this program will help me improve my Spanish a lot. I’m taking classes and all that, but I’m not taking any conversation courses so I don’t really get to speak it that much. I guess we’ll see in December how good I am when I get home!! Ahh… it is Sunday meaning the end of a very long week. It has basically been raining all day so far, but that’s okay because Sunday tends to be “recovery day”. This past week my friends and I went so many places and did so many things that I can’t even believe that it all happened in just one week! First, CIDE (my program) took us to the incredibly famous Guggenheim Museum that stands right across the river from my university. The Guggenheim was INSANE. I’ve never really been a huge fan of art museums. I never understood the artists true meaning of what they were painting or sculpting or anything. I just don’t have that artistic mindset. However, the Guggenheim was absolutely amazing. It was all modern art and it all had to pertain to something going on in the world today. There was one room with just one artists work in it, and all of his work was made out of trash. He would find things in the trash and then construct art with them to show how much we waste. It was incredible. There were many other rooms that I found fascinating, but there were two pieces of work that I liked the most. Unfortunately, I don’t know the name of the pieces of artists since we weren’t allowed to take pictures 😦 The first I think was actually called “Milk” but I could be wrong. It was made out of entirely pink yarn to resemble a grocery store. However, the actual scene was of a grocery store bombing that took place by a suicide bomber who was a 16 year old girl. The shelves were knocked over and there were just piles of yarn in places, I thought to represent people, as well as yarn hanging from the ceiling to represent the actual explosion. It was really cool. I wish I could have taken a picture. My second favorite was a cage. It was just a cage built out of incredibly strong, razor sharp wire. I think (if I remember correctly) it was the same wire that Hitler used in his concentration camps. The artist was going to make the cage larger, but he was not allowed to get anymore of the wire after a certain point. The piece was really interesting and I really liked it. Cool, right? 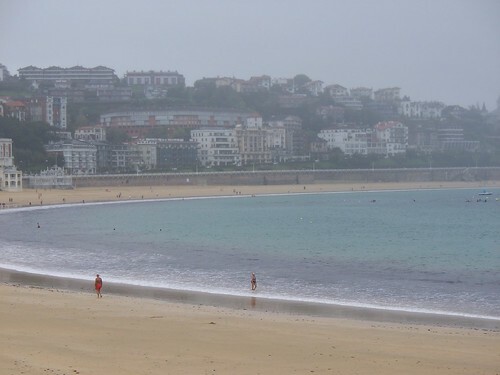 Well anyways… some friends and I decided we wanted to go to the beach and spend some time in the neighboring city of Getxo (the “tx” in the basque language makes a “ch” sound… so it would sound more like Getcho in English). Unfortunately, the day we went decided to be cloudy 😦 We had fun anyway though. 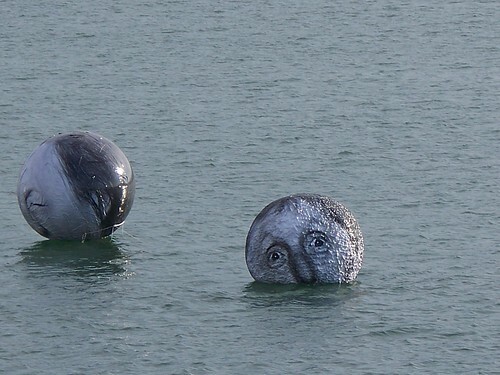 The water is beautiful, as well as the scenery. I snapped a few photos to show everyone. 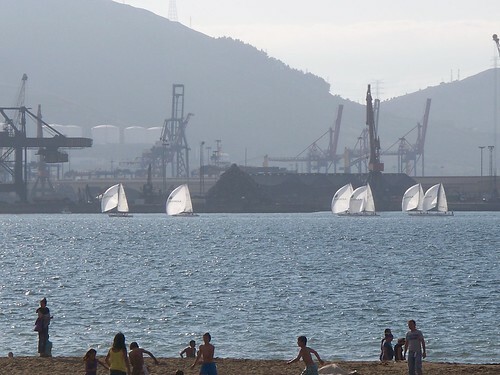 Getxo was really fun and its incredibly beautiful. People there are incredibly carefree and nice. I’m hoping the weather doesn’t get cold anytime soon so we can make another day trip back there with some nice weather! 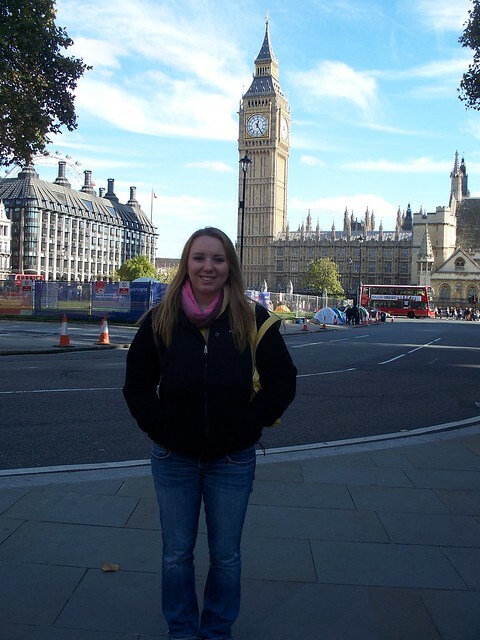 In between all of these trips, I have actually been going to school! Woo! I’m taking six classes, which include: business Spanish, Spanish composition, Europe in the world, international financial systems, economy of the EU, and transatlantic relations: the EU and the US. I really like all of my classes. Europe in the world is probably going to be my hardest class, mostly because it’s taught entirely in Spanish and I don’t exactly know all the terms to talk about politics and the economy. Other than that though, I really like the class and all my other classes. Except that I have class til 7pm everyday. Womp. The last one is from almost the top. It would be my luck that my camera battery would die when we were almost to the top. So unfortunately I don’t have any of those pictures. However, when I get some of those AMAZING pictures from my friends I will be sure to post them on here. Hello everyone! 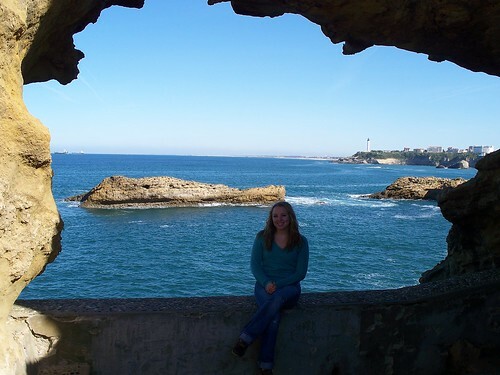 This is Katie’s Bilbao Blog that documents the life and times of a girl studying abroad in Bilbao, Spain for a semester. 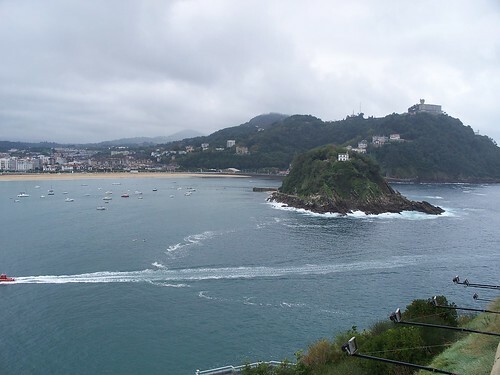 Bilbao is located in northern Spain, in the Basque country near the Bay of Biscay. 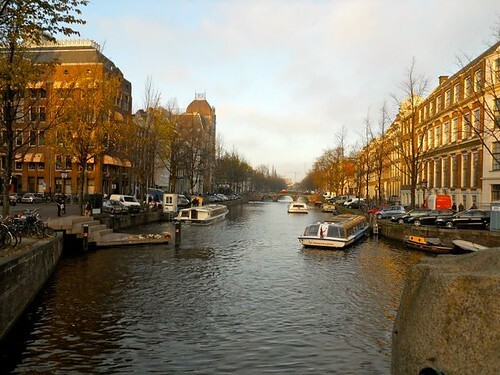 It is a beautiful city with lots of history and culture that I’m hoping to learn throughout this semester. 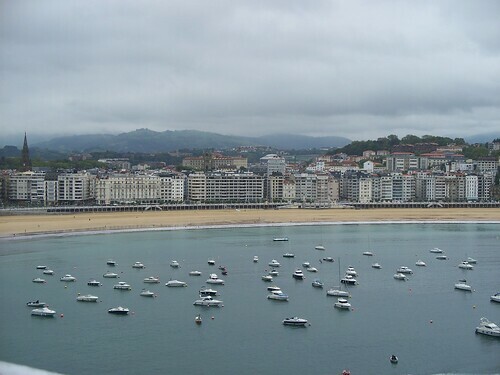 First off, Goda Euskadi basically means “Viva the Basque.” It’s like “Viva Espana” except since the Basque people wish to be separated from Spain, I made it Viva the Basque in Euskera, which is the language of the Basque people. Second off, the picture at the top of my blog is of the Guggenheim Museum. 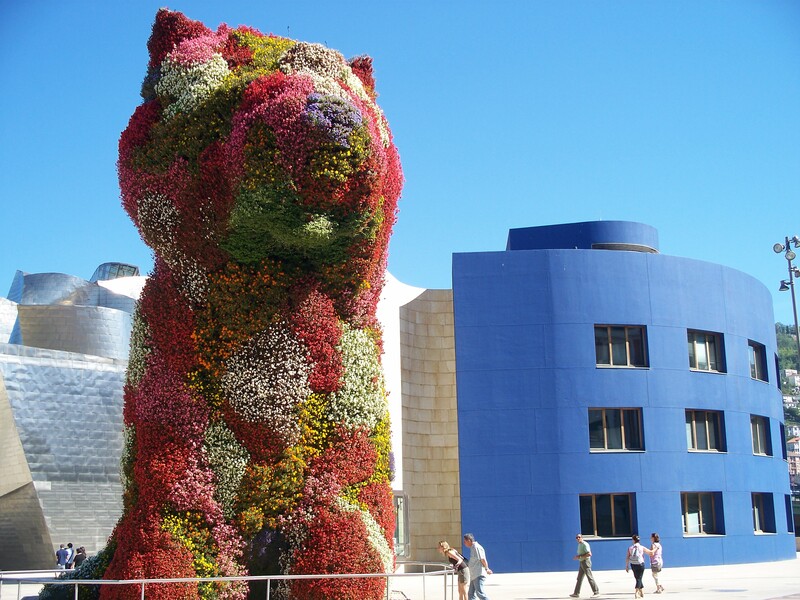 The Guggenheim is a very famous museum in the city of Bilbao and one of its main attractions. 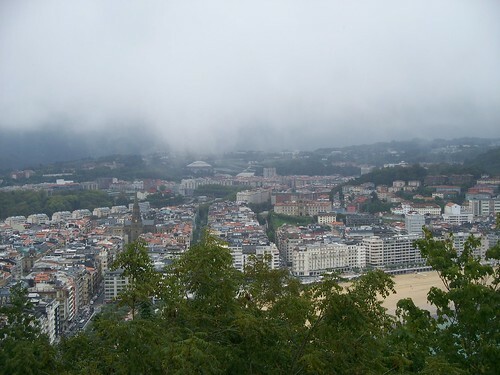 The museum is literally right across the river from the University of Deusto, where I’m studying. Third off, Hasieran means “the beginning” in Euskera (at least that’s what GoogleTranslate told me..) because that’s where I’m starting. So.. here we go! I’ve been here for about a week and I cannot believe how much I have done and seen. The city is absolutely breathtaking. I live in the dorms with some other kids in the program. Everyone has been so nice and it’s always good to know that there are other people in the same boat as you when you arrive. 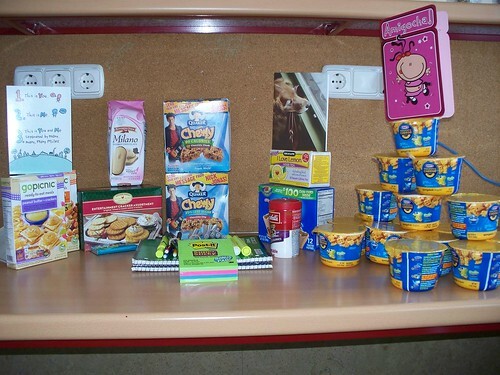 When we first got here we checked into the dorm and got our rooms. We were told to try and stay awake until 8 or 9pm Bilbao time in order to try and get rid of the jet lag quickly. I fell asleep around 6pm and then was off and on the rest of the night. The next day we had orientation. I got to see just how many people were here in the program and everyone was really excited. The teachers of the program welcomed us to Bilbao and explained a few things. We took a placement test and sat through some useful presentations about the city. After we went and had lunch with the group. Lunch was interesting. It’s very different than lunch in the states and we eat so much later. We started off with a big pasta dish that was DELICIOUS. There was so much of it though that I probably could have eaten it and taken some home for leftovers. This was just the first course. The second course consisted of chicken and fries. I don’t eat chicken so they gave me fish and it was so yummy. It was hard though because even though it was so good, it was just so much food and I wasn’t accustomed to eating that much. The people at my table and I sat around and ate the delicious meal and got to know each other a little better. It was nice to really meet people for the first time. After the second course, we had dessert. We had this incredibly sweet cake… and they gave us all two pieces. It really baffles me how much the Spaniards eat for just one meal, but yet they all seem to be skinny as sticks!! It was delicious but I could only take a couple bites before I felt like I was going to burst. After the delicious lunch, we went on a tour of the city. It was nice to finally get my bearings. 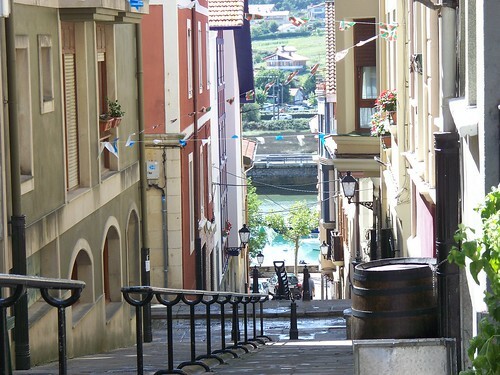 My favorite place by far in Bilbao is Casco Viejo, or the Old Quarter. It has all these cute little shops, coffee shops, bakeries, and the plaza nueva is so much fun. A couple of friends and I went there the other day and just sat and watched all the kids playing around with the parents. It was really enjoyable. 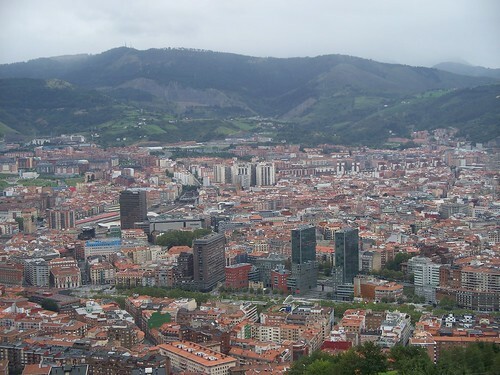 Here is a picture of the city from atop the Funicular, which is like a little train that goes up a mountain to a park where you can see ALL of the city. It was incredibly cool. You might think these pictures are lame, but I really want everyone to see how beautiful this city is. 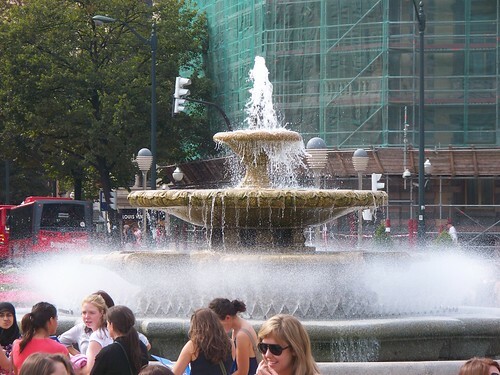 Its architecture is absolutely amazing, and everything from the houses to the fountains to the plazas are beautiful. On Friday night, a bunch of the CIDE (my program) kids went out to the bars in Casco Viejo. It was so much fun! The way they do it here is to go to one bar, get a drink, go outside and hang out and once everyone is done with their drink, continue on to a different bar. We hit up like four bars that night and they weren’t all close together. It was so much fun. I have become very fond of the kalimotxo which is red wine mixed with Coke. It has definitely become my drink of choice and I highly recommend it. 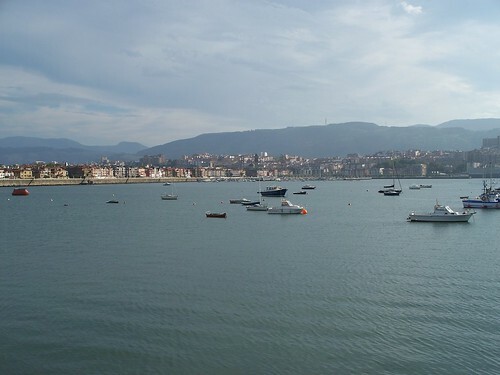 Saturday night we went to Plentzia, which is a beach near Bilbao, about a 30-40 minute metro ride. There was a huge fiesta there. The train was packed that we were on, and as soon as we go there, we looked across the bridge and the entire street was FULL of people. It was amazing. There was a carnival, outside bars, people selling hats and sunglasses, and everyone was just chilling outside drinking with their friends. We walked around a lot and it was so amazing. We were right next to La Ria. We didn’t get home until around 5am, which for me was very late, but early for the locals. 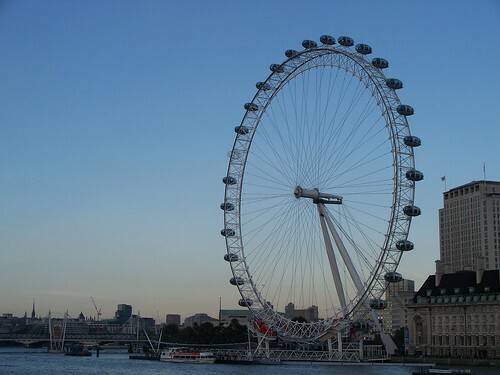 The excursion was fun and I’m looking forward to the other ones we have going to Madrid and the south of France. School started a few days ago. It’s been very different than UMW. I like it, though. I am taking six classes, which at first seemed like a lot, but now I think I can handle it. I feel like I have already learned so much more Spanish and I’ve only been here a week. It’s incredible. I really hope that I become fluent, or close to fluent, by the time I leave. I try and speak in Spanish as much as possible and just listening has helped me learn.